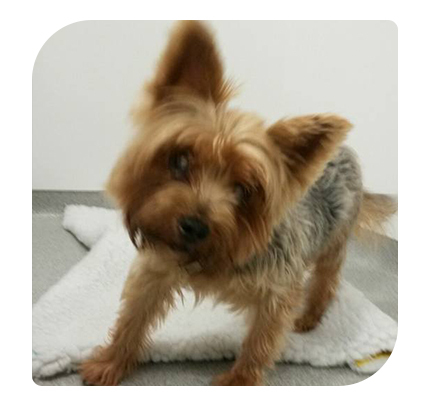 This handsome Yorkshire Terrier was found, looking very lost, so he was brought into The Vet where he was immediately scanned for a microchip. The team were glad to find that he had one, because a microchip usually means a lost pet and owner can be reunited with ease. There were two telephone numbers on the lost pup’s microchip record, so the team called both numbers, hopeful that one of these numbers would be the owner’s. The first person the team called, was very confused and said that it couldn’t possibly be their dog as they were looking at their dog at that very moment. Meanwhile the other number belonged to someone who had never owned a dog! This mystery surprised the team, because unusually the microchip posed no help in reuniting the lost dog with their owner due to the incorrect information logged to it, so a different method had to be used. A few pictures were taken and posted to our Facebook page in the hope that someone would recognise the lost dog. The team had to eventually hand the dog over to a warden, however all the comments and sharing of our Facebook post worked! Someone recognised the dog as belonging to their friend and told them, we are now happy to report that he is now safe and sound at home with his owners!